Active Dehydrator, PGE, Tract 293, Pad G, HuntleyRd. The Birth of a New PGE Frack Pad is Death Row for Trees - an album on Flickr. UPDATE: I now have permission to share with my readers the name of the gentleman whose words follow my brief introduction: Bob Deering. Bob's story has been profiled before--but I think his own words capture something more intimate and invaluable about what's happening in the "shalefields," a polite word for our forests, our farms, our homes. The following is a first-hand example of how the gas industry is allowed by the state to behave effectively like an invading army--and how citizens in the path of the gas wells live under what can only be described as martial law. We might be tempted to think that stories like this are exaggerated, embellished, or even fiction. But this is a first hand account of a private property owner living out his life on his own land--surrounded by gas wells and fracking infrastructure operated by Pennsylvania General Energy in Tiadaghton State Forest, Lycoming County, Pennsylvania--what one DCNR (Department of Conservation and Natural Resources) agent called Tiadaghton Industrial Park. I have not altered the written description in any way, nor have I deleted or added anything to it. I took the photographs on 6.22.14. "This is a description of events that occurred on June 18, 2014. I was ask to give an interview from NPR/WITF about how gas drilling has affected my quality of life since its inception 7 years ago. I began by giving a short site tour of an area to the rear of our property. From the very start we were followed by gas security people. As we proceeded out a state forest road--School House Road--we were approached by a guard vehicle that had been following us. he ask what we were doing, our names, and then proceeded to take a picture of my vehicle and another picture of my license plate. He then told us we were not allowed to take pictures of any well pads and mentioned this incident would have to be reported. At this point I made a cell phone call to the DCNR office to clarify what I was allowed to do and where I was allowed to walk; unfortunately I had to speak to a voice mail system and was told I'd be called back. We turned around and stopped at a construction site where a new pond and a compressor site is to be placed; one of the people with me mentioned: we have company again. We had a security car in front of us on School House Road. another parked in front of us on Okome Road. he ask me whether I thought they were trying to block us in. We were totally off either road that would obstruct traffic flow. The guard cars just sat there and watched us, as we moved, they moved, we stopped they stopped, until we left and they followed us until I turned onto the road to our house. At what point is this type of activity harassment of the public. I am tired of being followed like I am a criminal, I'm tired of telling the guards every day where I'm going on the roads. These people were originally only placed to prevent traffic flow problems when an OVERSIZED GAS COMPANY truck was using the road. Now they have taken total control of all traffic flow no matter what type of vehicles are using the roads. This is not an issue totally with the security people, they work for PGE. After returning the people doing the interview I proceeded to the DCNR office since I didn't get a return phone call. I spoke with a forestry person that explained to me that I did nothing wrong and where I was allowed to go and the incident would be taken care of...After that visit I returned towards home, when I got to the intersection before my home, another guard approached me and ask how things were going and then proceeded to tell me why I was being followed. he said it was for my own safety from any truck drivers or gas well personnel. I disagree with that answer; if that is the case why don't they follow every vehicle that uses the road. If it is the answer they have some very severe personnel issues to deal with. I do not believe this is going to be the end of this issue. The more I think about the circumstances, the madder I am getting. I wish I would have been accepted as a candidate for the PEDF hearing in harrisburg. To me it was an embarrassing situation. Typed while I still remember the conditions. specified in paragraphs (4), (5) and (6). Section 2709 - Title 18 - CRIMES AND OFFENSES." 1. The liquidation of Tiadaghton State Forest by PGE. 2. The repressive jackboot tactics utilized with the blessing of the state by the gas industry. Under such conditions, none are free. Under such conditions, freedom of expression, freedom of movement, are effectively criminalized. When did the gas companies take over? When did they gain the right--in the name of safety--to tell me what to do? Can anyone really "stop the job at any time"? Only when we, the citizens, become brave enough to take seriously the promise of democracy. The gas companies are counting on us to remain cowards. They count on us to be pacified by the hollow promise of "regulations," "best practices" and perhaps a severance tax. A tax, of course, is just a gift to the frackers--it legitimates and institutionalizes the industry by making social programs and education dependent on the revenue. So--they're even liars when they feign opposition to taxation. Note the deer fencing--to protect the forest from the deer. My new friend, who generously gave me his words, may not agree with me here. I don't know. What I do know is that his quality of life--his very way of life--has been sorely compromised, and without justification. responsibility--to record and expose what you are doing to my fellows, and the polluted wasteland you're making of the air and water upon which we all depend. for 15 minutes--on a public road. My rights are not dictated by your profit margins. Tiadaghton State Forest--now a NO TRESPASSING zone. Below is my response to Democrat Party candidate, Steve Todd, and his defense of the claim that it is consistent with identifying as a "fractivist" the Democrat Party gubernatorial candidate, Tom Wolf's plan to impose a tax on the natural gas industry. The defense of a tax on the gas industry is not consistent with any position whose goal is to end fracking. In fact, it's self-defeating. "Wendy, I call myself a fracktivist. And I support a tax. Because I know the entire world is not going to march lockstep to my edicts. I admire your work (we have attended numerous events together, are FB friends and have met several times). I am on your side. And Alex Lotorto’s side. The same Alex I had to unfriend on FB because of his relentless and very personal attacks on my positions. I am backing Wolf, being a Dem Committeeman (Dauphin County), but I wish you and Glover all the best. But if you do win, I am 100% certain you will be a little disappointed. Winning a political office does not mean you march in and everyone shuts up, and prepares their pens for orders. Folks like Victoria and Tom (with whom I am also acquainted and have worked) are on our side…yours, Alex’, Vera’s, Rebecca’s and mine. It should shock no one to learn that none of those folks march lockstep on the issues of the day…it would be a scary world in which we did." Hi Steve, and thank you for your reply. The argument against a tax--severance or otherwise-- is very clear, as are its implications with respect to who gets to honestly call themselves anti-fracking--and that is not and cannot be you or, for that matter, anyone who supports a tax. I invite you to demonstrate where this argument fails. You might argue, for example, that the argument for a tax is "being realistic," and that a tax is better than no tax. The problem with this reasoning is that I have shown that a tax is far worse than no tax because it institutionalizes the industry in the state's fiduciary structure--with the implications I have spelled out. You might argue that these implications-- social program dependence, education funding--don't necessarily follow. But indeed they do, and the history of the state shows it. Moreover, we cannot rationally believe otherwise given that Corbett has gutted these programs such that there exists a funding vacuum that Wolf is clearly prepared to fill with frack-dollars. You might argue that there's no necessary connection between social program dependence and the weakening of already weak environmental and safety regulations. You're correct--there is no necessary relationship. But there will be an empirically demonstrable one since the need to fund these programs will continue--and for some escalate--creating pressure to generate more revenue. That just IS the history of taxation. To use the language of "march lockstep to my edicts" is ad hominem and implies that I have acted in a dictatorial fashion. That is false--I have laid out arguments premised on reason and evidence, and to resort to this variety of name-calling only implies that because you can't offer reasoned and evidenced objections you're comfortable with punches that are below the belt. That is unbefitting a candidate for office. That you are backing Wolf because--as you put it--you are a Democrat councilman is simply to say that you feel yourself compelled to march lock-step with your party regardless their positions. You are not so bound--and this is the pot calling the kettle black. Wishing myself and Glover the best is wholly disingenuous and easy for you because it costs you no political capital. I also am not interested in being patronized--and your claim about being disappointed that winning does not mean people will simply "shut up" and follow orders is just that. But it is consistent with your strategic attack to get readers here to identify a clear and resolute position with "lock-step" and dictatorial. This is how those who want to have it both ways--be identified as anti-fracking, all the while acting in a fashion that is in fact complicit with the gas industry--paint those who are genuinely anti-fracking as irrational because we argue that given the failures of regulation and the inherent hazards of extraction infrastructure, the only morally defensible rational position to take is to fight for a ban. But your unwillingness to take up this fight can neither be identified as moral nor rational--and one evidence for this is your willingness to paint those who'd defend a ban as the dictatorial radicals in order to make yourself appear reasonable. But in this case appearances are deceiving. Your promotion of a tax is not morally defensible because--as I have shown--it will lead to indefensibly harmful consequences. Now that you know this, to continue to defend the tax can only be seen as politically expedient--about being electable--but it is not anti-fracking. The time to defend a tax, to defend regulation--especially in the face of pieces like this one--to defend "best practices" is over. None of us have a right to this ignorance--least of all those who'd pretend to represent us. To make this claim is not dictatorial, sectarian (and nathan Sooy would have it) or narrow. It is realistic. It is to acknowledge the fundamental truth that none of us involved in this struggle have any right to find one iota of this article about silencing surprising. We all know better, and it is high time we acted like it. Bruce Anderson goes to great lengths to reassure his audience that he's an "environmentalist," and that he's not employed by the gas companies. He is keen to establish his credibility as a " federally licensed nuclear reactor control room operator" presumably to reassure us that he's got his own income and that he's a smart guy. But that's just the set up for a meeting of the Columbia County Landowners Coalition (Columbia County Landowners Coalition) designed to reassure the audience that what they'll be hearing is neutral, objective information. And that's true--as far as it goes. But clues that this isn't really an informational meeting--but a promotional for Williams Partner's (WPZ)"Atlantic Sunrise" (ASP) expansion of the TRANSCO begin to pile up the minute Anderson transits from "you can trust me" reassurance to what amounts to lease coordinator for WPZ. Clue One: Consider Anderson's first content slide. This claim is true--but it assumes that all that is needed to make the region's shale plays productive are the pipelines to move the gas to market--leaving his audience with the impression that if they had leased land to drilling they might still make out on future royalties. All drilling activity by Williams is on hold in Columbia county pending the status of the Martin well. The well next to Bear fuel on #118 is also on hold indefinitely. That site had a test well drilled earlier this year. The major operator is EXCO with Williams being a joint venture partner with a 10% interest. Williams was informed several weeks ago that EXCO has abondoned any further operations at that site due to lack of positive data from the test well and the failure of the Martin well to produce any meaningful gas volume. (Forum 656148: Don't Get Too Excited). To imply that "lack of pipeline" is responsible for lack of frack gas production is a bit disingenuous--there's no pressure down the hole, and there isn't likely to be in these "dead zones." Moreover, the claim that "the economics were not here," while also true isn't the whole story. As I've shown, the economics aren't here, or even "here" in the United States. The economics are in LNG export to global markets, and while Williams claims that "there are no LNG [Liquified Natural Gas] terminal facilities related to or proposed as part of the Project," the relationship between Williams and Dominion--who wants to convert an LNG import to export at Cove Point, MD--is cozy if not incestuous. Dominion purchased the Cove Point facility from Williams in 2002 for $217 million, and the reference to Fairfax County, Virginia in the WPZ FERC Pre-Filing Documents is at least indirectly connected to Dominion's plan at Cove Point. Dominion's project slogan is "Support Maryland Sending Clean Energy to the World," and Williams certainly comprehends the opportunity to export to Chinese and Indian buyers, for example, the Gulf Trace Project (THE WRENCH: When Sunrise for the Global Gas Markets is Sunset for Pennsylvania: Williams Partner's "Atlantic Sunrise" Expansion of the TRANSCO). At the CCLC WPZ Promotional, Anderson bristled audibly when I pointed out that ASP was on its way to LNG export--but the maps he himself presented make this clear. UPSHOT: (1) whatever money lease-holders might stand to make off the ASP, it isn't going to be because any drill sites in Columbia County are going to miraculously re-pressurize. So it just isn't lack of pipeline--at least not here--that's going to make folks rich. (2) Any notion you might have that you're doing your patriotic duty or contributing to national security is unvarnished Bull-Pucky. As I have said a gazillion times, the gas industry waves the flag for one reason, and one reason only, to sucker you into leasing your land so they can make piles of profits all the while externalizing the long-term costs to your property value loss, your polluted water, your fractured community, your ill-health, and your screwed over kids. Clue Two: Anderson resorts to fear-mongering and an "us against them" strategy to get his audience to circle the wagons--and lease their land. One of the public meetings Anderson attended was a meeting of Columbia County Pipeline Awareness (CCPA)--a newly formed group aimed primarily at encouraging folks along the ASP right-of-way to engage the FERC comment process. Despite his claim that "all the guest speakers were from outside Columbia County" all of the speakers at the CCPA meeting --guest or otherwise--were either local or regional--and several had farms directly on the ASP right-of-way. To claim otherwise is not only false, it's an attempt to create distrust--fear--among landowners on the ASP right-of-way by implying that these "outsiders" have some agenda other than, say, telling the truth. 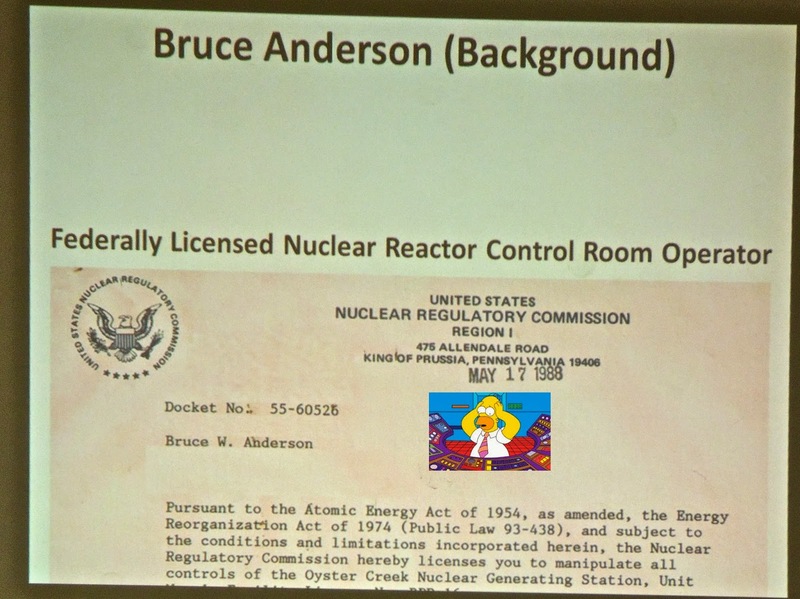 It's also notable that when Anderson and his wife were cordially asked to identify themselves and provide a reason for coming to the meeting, they did not reveal that they headed the Columbia County Landowner's Coalition, and that CCLC's stated objective is "to help land owners in their respective communities to obtain the best value and lease options for a comprehensive gas lease on their property in the Marcellus Shale and other formations," AKA: make the most money leasing their land (Columbia County Landowners Coalition). The Anderson's came to the CCPA meeting to do reconnaissance for CCLC in the interest of insuring that resistance doesn't reach the landowners. Why else have Benton Police at the CCLC Shin-dig? What Anderson means by "fear," of course, is that these out-sider meetings include factual information that CCLC doesn't want its members to think about too much--like WPZ' record of accident and explosion. But if this was my land, I'd surely want to know stuff like this--wouldn't you? 1. 2008 – Natural gas explosion in Virginia [Transco] the blast ripped a 32-foot section of pipe from the ground and caused a 1,100 feet burn zone. Property damage reported to exceed $3 million. 2. 2010 – Transco Pipeline leak in Texas. Leak was not reported for 4 days. The 1/4 inch diameter leak caused a reported $57,000 in property damage. Aerial patrol did not see the leak. Found by an operator who saw some bubbles. 3. 2010 / 2011– FINED $275 Thousand over failing to implement and/or maintain storm water measures to prevent potential pollutants during planned construction in Parachute, Colorado. State inspectors notified Williams (Bargath) in Nov. 2010 of violations and told them to take immediate action. According to report, Williams did not fix violation for 7 months. 4. 2013 (Jan) – Williams discovers leak of NGLs in Parachute plant while working on construction to expand the plant. Reports say the leak was found by ACCIDENT. Leak stopped, but Benzene, a cancer causing agent, has contaminated soil. Williams says leak not affecting creek. (March 15) – Groundwater in Parachute is contaminated with Benzene from NGL leak. Spill finally announced to public. Benzene is cancer-causing agent that breaks down bone marrow. 5. 2012 – Gas leak caused explosion at Natural Gas Compressor Station inPennsylvania. Williams restarts the station within 24 hours and started pumping fracked gas despite request from PA Dept. of Environmental Protection not to do so. DEP states they make it very clear on the above matter but because it was not an official order no fines were issued. 1 ton of Methane released. 6. 2013 (April) – Williams say faulty pressure gauge cause of leak in Parachute. Diesel found at gates of Parachute water supply. Benzene detected in creek. State Health Dept takes over oversight of leak. (8) (9) (May) – Benzene levels rise in Parachute, CO creek. State agency tells Williams violated it the law. (8). Williams announces it will not expand the Parachute, Co plant expansion NOT because of the NGL leak but due to low gas prices. 7. 2013 (June 13) – Williams’ Natural Gas Liquid (NGL) cracker plant that process NGLs in Louisiana. Explodes and Burns. That chemical plant was in middle of $350 million expansion. 700 contract workers were present; 2 people killed (ages 29 & 47); 70 injuries; 62,000 pounds of toxic chemical released. 8. 2014 (May 14)A probe into safety practices at pipeline operator Williams Cos. (WMB) is being expanded after a natural gas plant fire led to the evacuation of a town in Wyoming last month, the company’s third accident in a year… In December, the U.S. Occupational Safety and Health Administration cited Williams for six safety violations at the Geismar plant and proposed a $99,000 fine. Does that information potentially create fear? You bet. At least if you've got any sense. But that's not rightly called "fear mongering." In Williams' case, it's called truth telling. Upshot: just because you may not want to know the ecological and health hazards of Williams expansion of the TRANSCO doesn't mean they don't exist. Any informational meeting that does not include this is far more than remiss--it is grotesquely liable for omission. Clue Three: Anderson tells the audience that the letters they've received from Williams "contain a permission form which grants permission for survey work only." While that may be true--it is a serious misrepresentation of Williams' intentions. Once you grant them access to your land, they are going to exert all the pressure of an invading army to get you to sign a lease. Anderson acknowledges the possibility that Williams can take your land without your permission--but hedges it. He then answers a question about whether land can be taken via forced pooling by claiming that it can't because ACT 13 was overturned! 1. ACT 13 was a state law overturned in part--not in whole, and the part that was overturned did effectively gut municipalities from being able to control drilling operations within their borders. This was patently unconstitutional, reflected the corruption of the Corbett administration, and was rightly shot down. 2. Act 13 never addressed forced pooling. Period. End of story. 3. The ACT 13 decision is irrelevant at least to the extent that ASP crosses not only municipality boundaries--but state boundaries--and hence state law would have had virtually no say about ASP in any case. This will be reinforced if FERC grants Williams the status of a public utility. All the Act 13s in the world weren't going to keep Williams from appealing to eminent domain to get right-of-way on your land. 4. By allowing Universal Field Services to survey, you're helping Williams plan and execute a 42 inch natural gas pipeline--including its compressors, dehydrators, and LNG export to the highest bidder. Upshot: don't waste your time thinking that a little bitty survey isn't an agreement with Williams. It is. Once that flagging is up, once Williams is settled on their route, they are going to build that pipeline, and if they have to use eminent domain to do it, be prepared. The moral of my story is simple: there are lots of "Andersons," and whether they're on the payroll of the gas companies or not, their aim is to deliver you to the landman. Meetings that advertise themselves as informational--but omit critical data about property rights, potential for accident, the refusal of insurance companies to insure you if you have a gas lease (See Erie's above) do you a serious disservice. Starting with the survey "request," tell the landman no. Tell him to leave. Then make a copy of this, and go talk to your neighbor. FERC is entirely useless, but when enough folks on the right-of-way say no, stick to their guns, and act like a community, Williams just might get the message.